Normally, a turbocharger is designed to last for the lifetime of an engine. 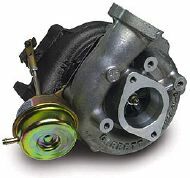 But in the unlikely case that a turbocharger becomes damaged, Precision can help with sourcing new or remanufactured units; or carrying out turbo repairs where the model is perhaps disontinued. Precision can supply new turbo units for most applications, whether it is automotive, industrial, marine, agricultural or commercial. Alternatively, we can source remanufactured, exchange turbos. Remanufactured turbochargers are a cost-efficient alternative to new units and go through the same stringent quality control tests as new products and are therefore offering not only the same performance and reliability but also the same warranty as buying new. All of our turbochargers are tested and balanced on the latest computerised machines at speeds of tens of thousands of RPM and are all calibrated prior to final quality inspection. Remanufactured turbos are a very speedy alternative to having your own turbo repaired / overhauled as we can usually supply these next day. We cater for all popular makes and models of turbochargers (Garrett, Schwitzer, KKK, Holset, IHI, Mitsubishi) but if you have a discontinued or obsolete model then we can usually overhaul your own unit - we will try to source the part from any part in the world necessary to enable our team to complete your job and to an unrivalled quality.